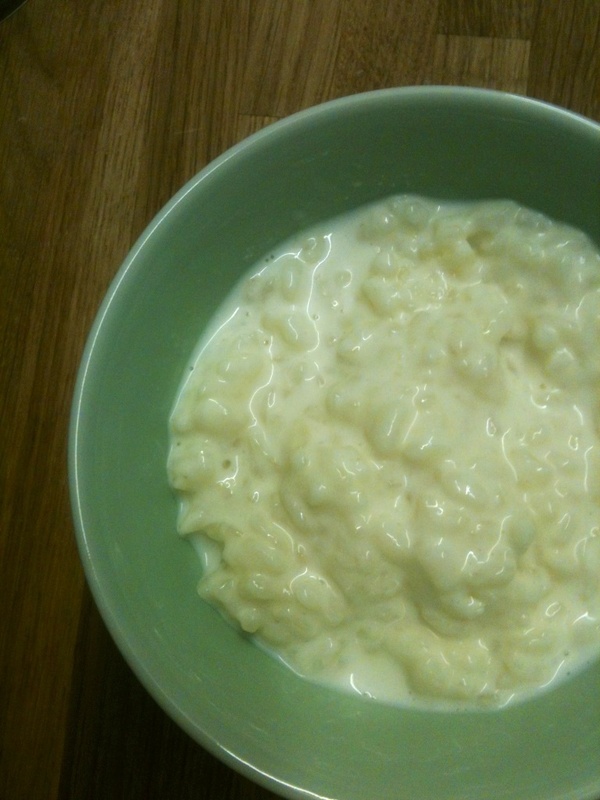 You know when you get a craving for rice pudding, or rather one of your brood does, there is no way you want to wait three plus hours for the oven(or even longer the slow cooker)? Well, this is the recipe you need. Melt the butter in a small pan over a low heat until foaming. 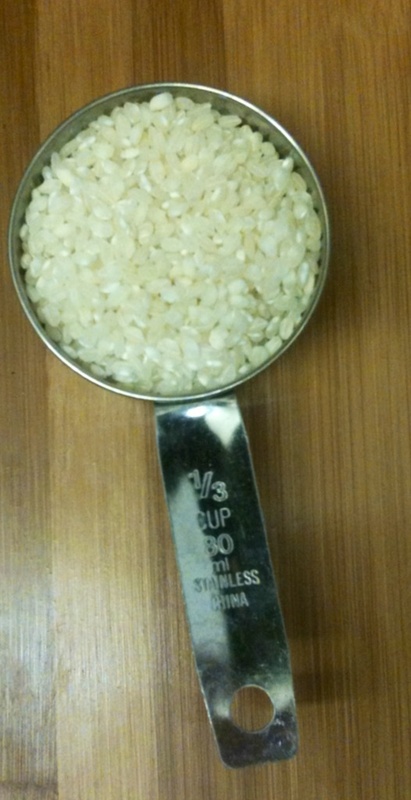 Add the rice and stir to coat the grains, cook for a minute or two. 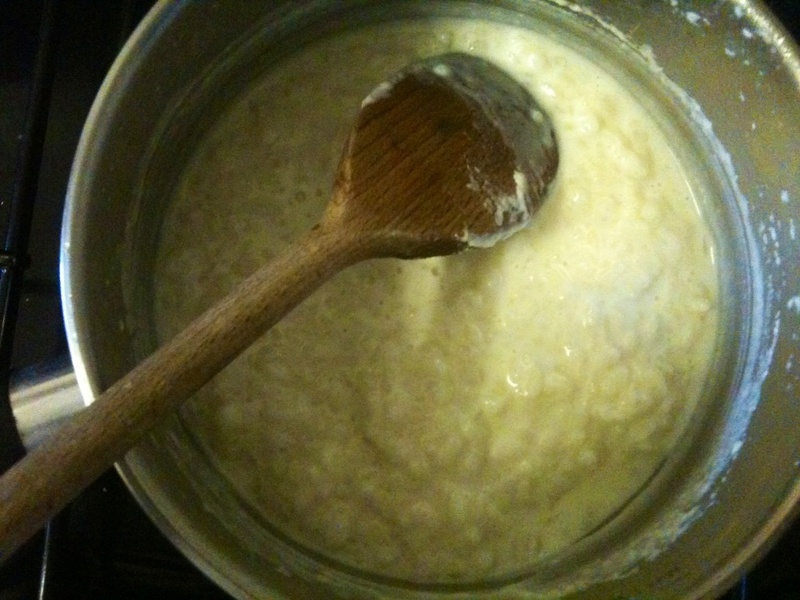 Once the rice is thickened, creamy and cooked stir in the sugar to melt. That’s probably the cheesiest blog title I could write isn’t it? But it is very early in the morning l, and it does convey how I feel about this yummy, versatile, easy-peasy food(conveys none of my true feelings on the singer, but that’s more about my dislike of soft rock ballads and less about the man). If you’ve never tried to make meatloaf I would urge you to do so, even cooked(and eaten) only once you’ll fall in love. 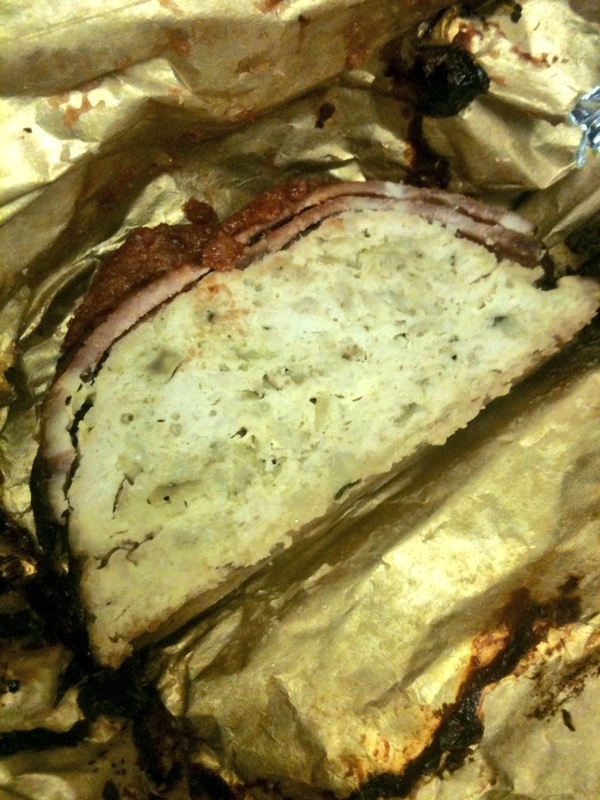 There are so many ways to “pimp” your loaf(spices/herbs in the mix) and SO many ways to eat it(think sandwiches, a slice as a “burger”, or a snack in your hand at 3:24am, not that I’ve done that one. Ever.)! I’d marry meatloaf if I could. See? Told you it’s power is immense! Fry chopped onion until soft and translucent(if you’ve minced it, save time and skip this step). In a large bowl put breadcrumbs and oats, pour over milk and set aside for 5 minutes. Put your favourite song on the CD machine/record player/iPod/gramophone and dance around the kitchen. Next add to the breadcrumb/oat mix the mince, tip in the cheese, salt and good grinding of pepper, throw in the onions, crack in 4 eggs, do a little dance, get down tonight! Squish together with your hands(that you’ve washed) to combine, don’t go too mad here, overworking is the enemy of a nicely textured loaf! Form into a loaf shape. Place in oven for 35-40 mins. 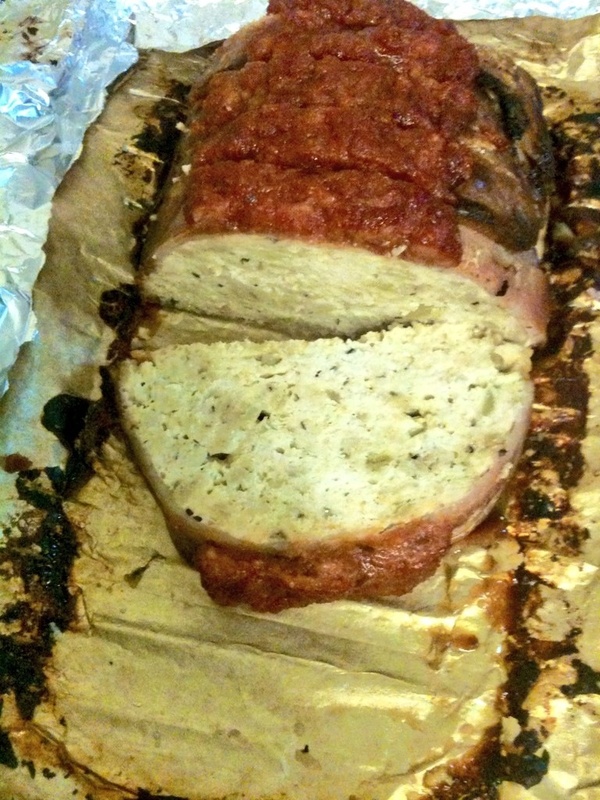 Take the loaf from the oven and spread the sauce in a line down the middle(lengthways). Put back in the oven for 15-20 mins. After the time is up, take meatloaf(loaves) from oven. Cool a little before cutting as this makes slicing easier(the next day is even easier still)! Serve with mash and veggies, that kind of thing. Go out and buy an engagement ring & hire a tux/white frock. This is a great gift! 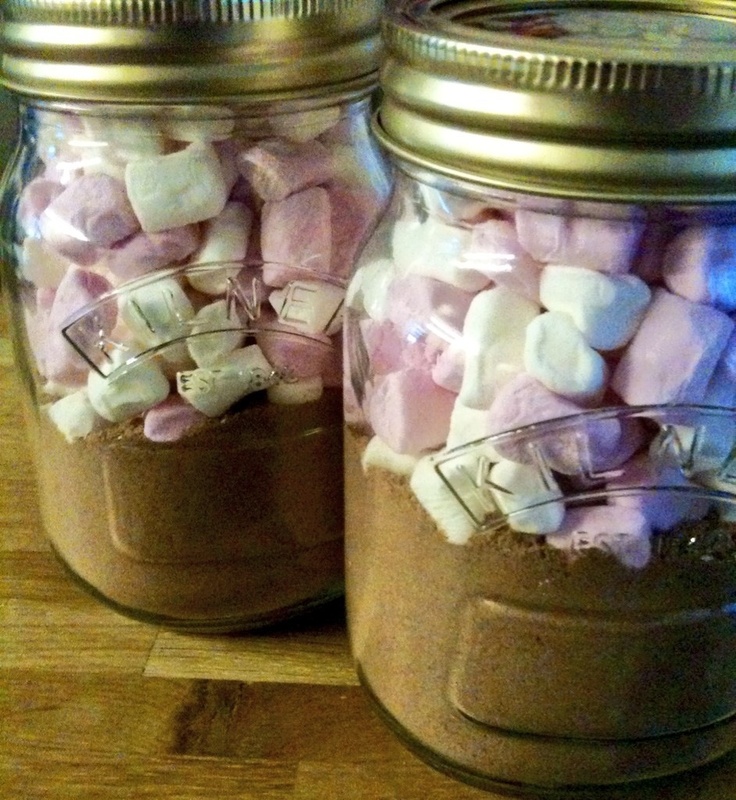 Who wouldn’t love you forever if you gave them a jar of yummy chocolatey creamy hot chocolate mix? Nobody that’s who, especially if you put cute mini marshmallow in it too! I love good hot chocolate. But rarely does a coffee shop get it bang on. My brother(with my help as taste tester-yay! best job EVER!) found the perfect chocolate for his customers. This mix(tested/tweaked extensively by me for your pleasure) evokes the same memory I had back then, tasty, rich and creamy. YUM! If you can get your hands on Nido full fat dried milk please do, otherwise a tin of Marvel(or similar) will suffice(and me a tad healthier). This amount of mix makes between 9-10 mugs of hot chocolate. First grind your bar/block of chocolate. I used my trusty coffee grinder for this but you can use your processor too. You want it as fine as a powder (“fine” on my grinder). The next part is so easy that I’m not even going to add photos or even much in the way of instructions. Stick the ingredients in a food processor(even easier if you are already using one!) and whizz to mix up. Seriously, this is the easiest “recipe” ever, but brilliant all the same. 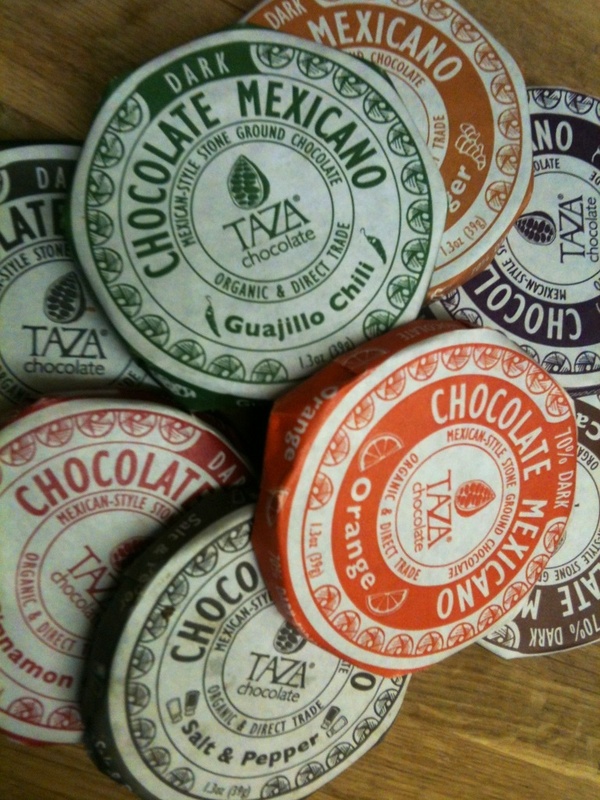 There are endless ways to tweak the mix, and with the variety of Taza flavours it could get very interesting ! To make up the hot chocolate put two well rounded tbsp in a mug add little hot water(yes really) and mix to a paste. Make up to a full mug with warm milk OR if you’re feeling virtuous and healthy(ish) you can make up with all water. Remember to attach a note if you’re gifting this(unlike me, who got all caught up in how brilliant this was and then had to text everyone afterwards. Don’t be me.) & then make up another batch(or three) to gift to yourself! You just know these are going to be good right? I mean good even before I tell you they are super duper easy peasy to make and quick to boot. For minimal effort(doesn’t take long to stew apples does it?) you get maximum results. Even if it is using ready made pizza dough I don’t care. Sometimes life is just too short to make your own dough! Here’s the hard part make some stewed apples! 2 Bramley apples chopped plus 1-2 tbsp water and 1-2 tbsp light brown sugar(depending on your taste). Place everything in a small pan and cook over low heat until apples are soft and tender. However, if you have been making apple butter(or have scored a jar from a kindly neighbour/relative/friend) then this would be perfect here! 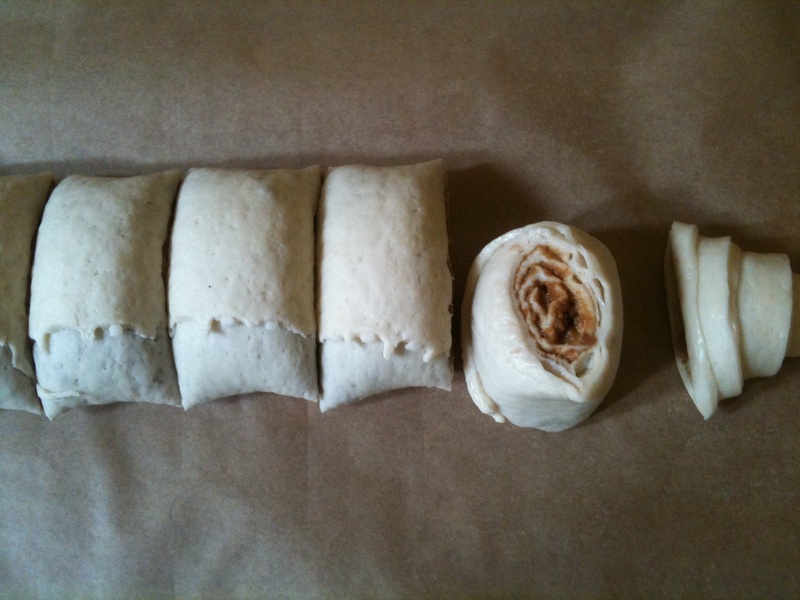 To make the rolls open the tube of dough and roll out. 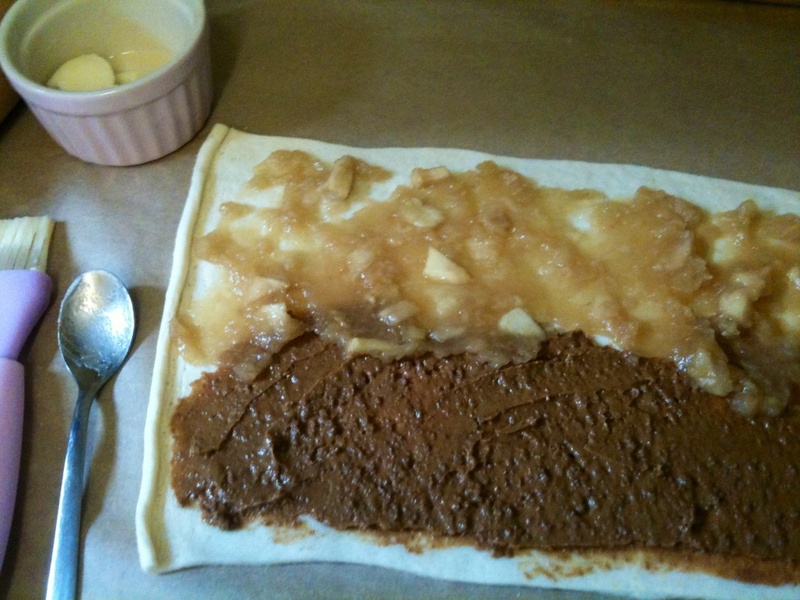 Spread half of the dough with Biscoff and then the other with stewed apple(or apple butter). Remember to leave a gap at the top edge so your filling won’t squish out! 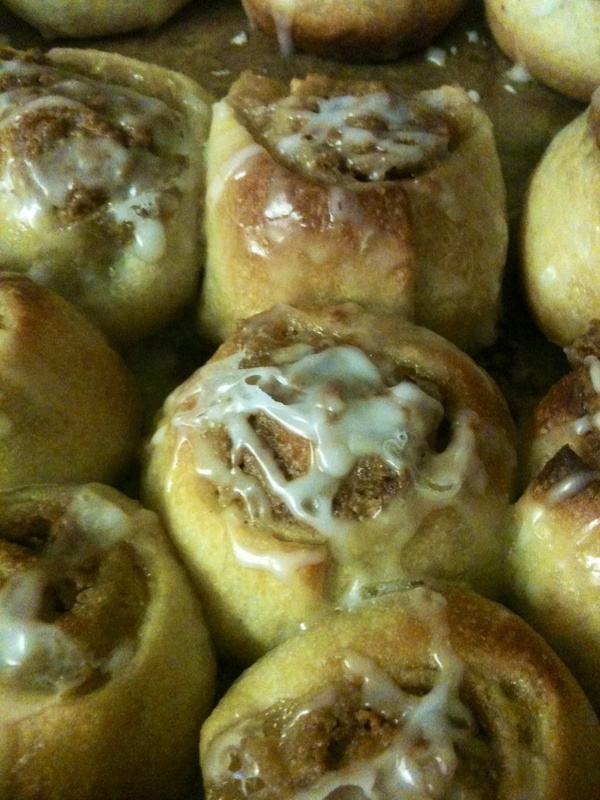 Cut into two inch pieces, this size makes a perfect two bite roll, and place into a baking tin(or a muffin pan). Brush with a little melted butter and bake at 200c for 12-15mins. Remove from over and cool before drizzling with a little icing. 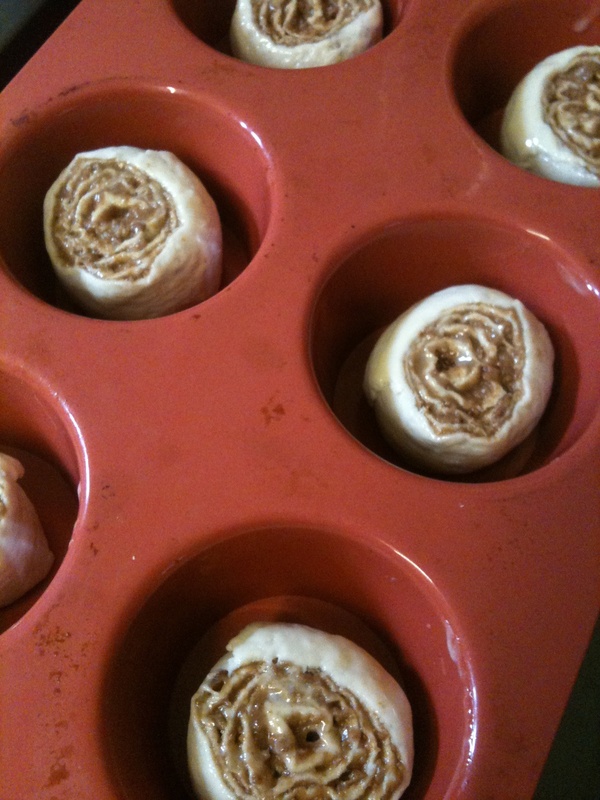 ^that is a photo of the Biscoff only rolls again, but they are so pretty I had to show you! 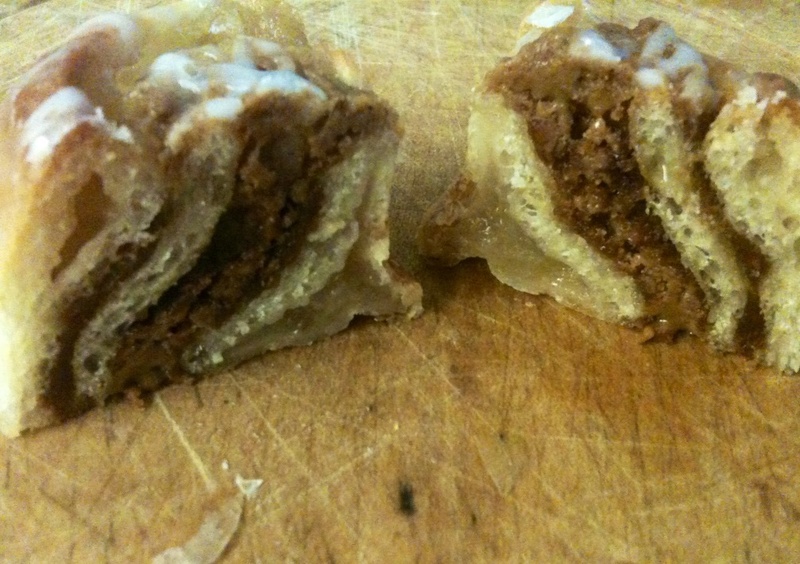 I rolled these from the short end(left to right) this time which made lots of lovely cinnamony layers-yum! Wow! You know sometimes you’re surprised by just how well a thing turns out? Like the Impossible Pie? This is one of those times…just wow! This has to be the ULTIMATE make do & mend recipe(I can’t wait to share it with Jen and everyone on Thursday’s Twitter meet #makedoandmendhour)! 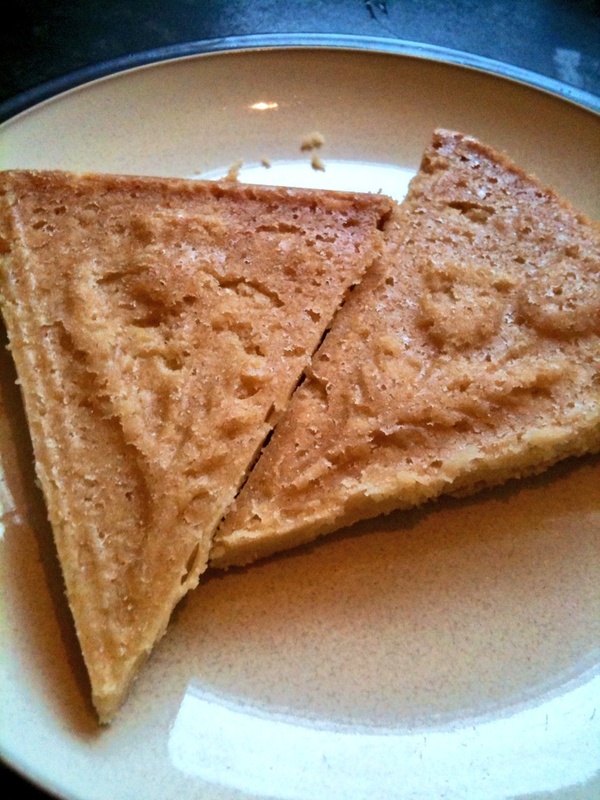 Created during the Depression era in the US when expensive items were hard to come by, this egg/butter less cake is a godsend to Vegans or those with an intolerance to eggs/dairy! 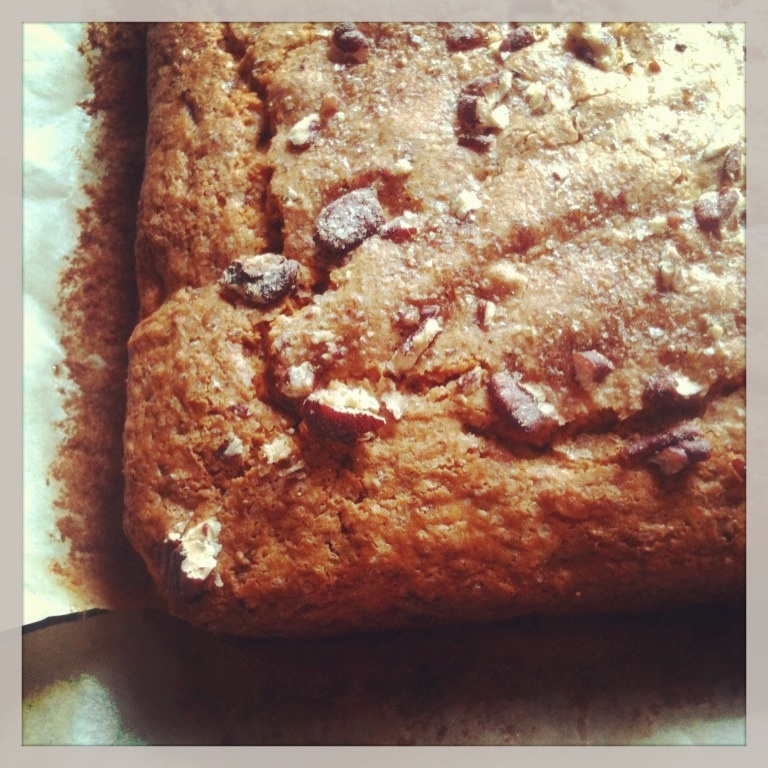 I trialled a number of vegan recipes when I worked baking for the coffee shop, oh how I wish I had this recipe then! 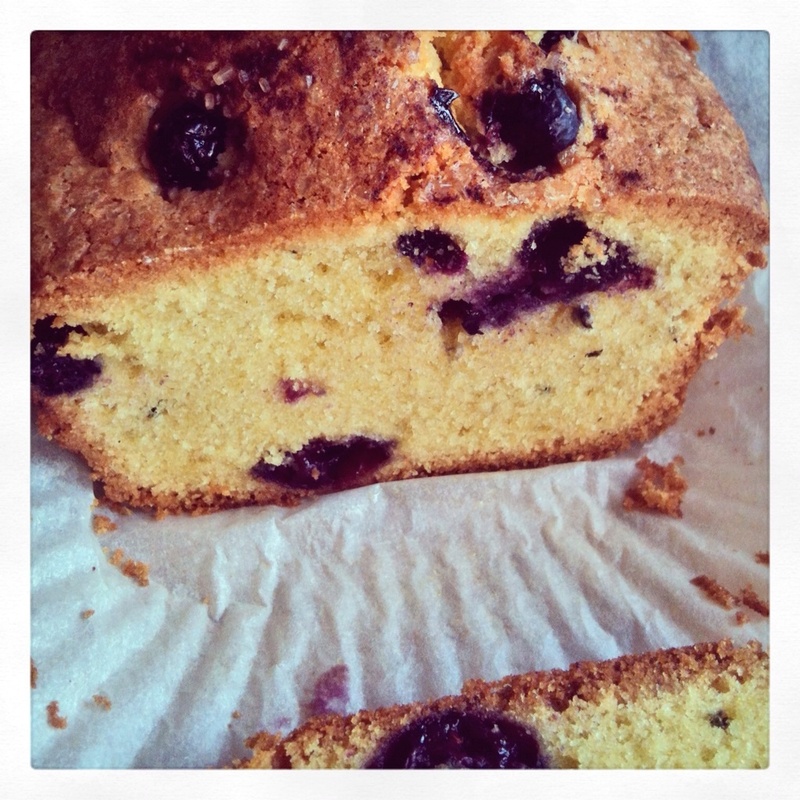 I wondered for a long time about this cake, not convinced it could ever be good with no eggs. 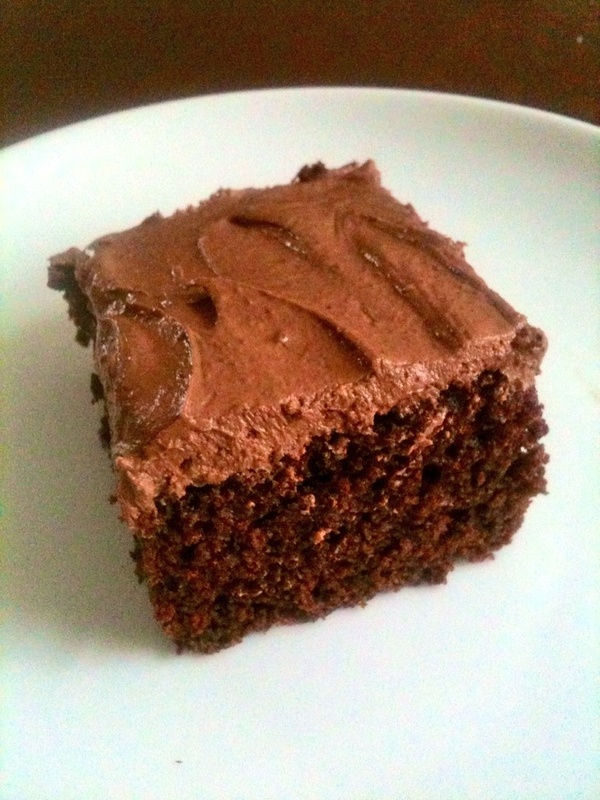 Having now made it you can trust me when I say this cake is not only good for a vegan but a good one for EVERYONE! It’s an easy recipe is a great activity for kids(I let my toddler help) I plan on letting my eldest try it out next, I figure everyone needs to know how to make at least one great cake! I tweaked the recipe slightly as I didn’t have any vinegar(usually a Depression Cake has vinegar as it reacts with the baking soda to cause a rise in the cake) but did have some flat-ish cola! It works really well as the “acid” part needed for the reaction. I used a rectangular cake pan but you could use an 8″ round too. Sift the dry together into the pan, then in a jug measure out the wet, THEN pour that over the dry. 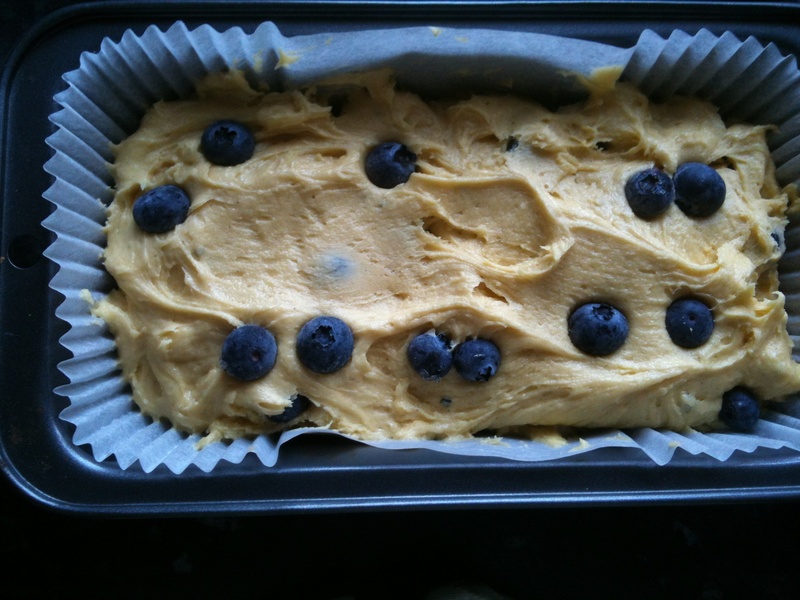 Mix with a fork(plastic one is best if your pan is non-stick) until no floury bits are visible. Bake at 360/180 for 30 mins or until a toothpick comes out clean. Frost with your favourite frosting(I made buttercream) or glaze. Ps. If you don’t have cola but do have vinegar you can just use plain water in place of the cola and add 1 tbsp of white vinegar! 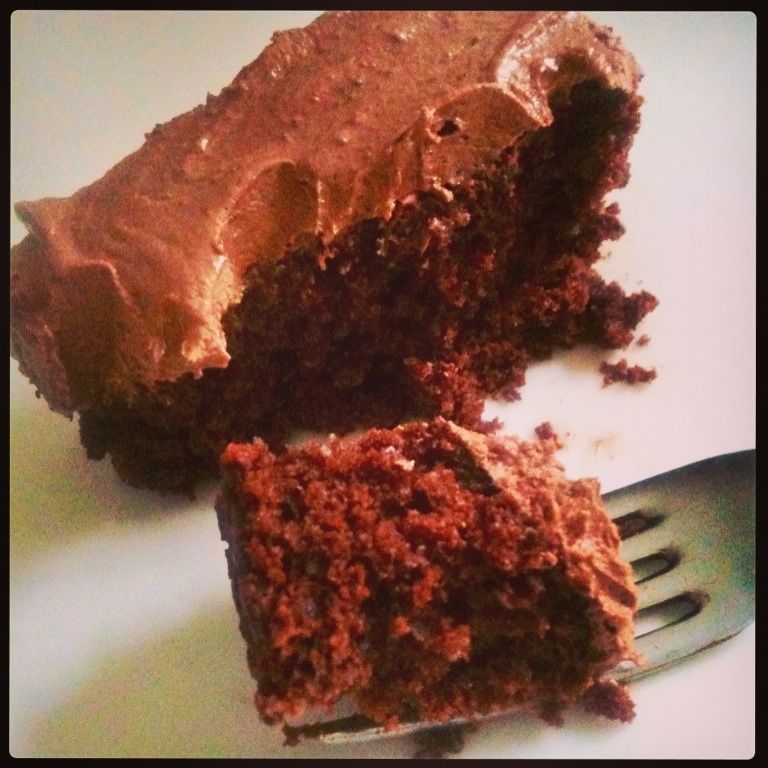 *EDIT* I have since tried to make the cake without sieving the ingredients(like recipe on the net said) I also used cold coffee in place of cola(water) DO NOT DO THIS! 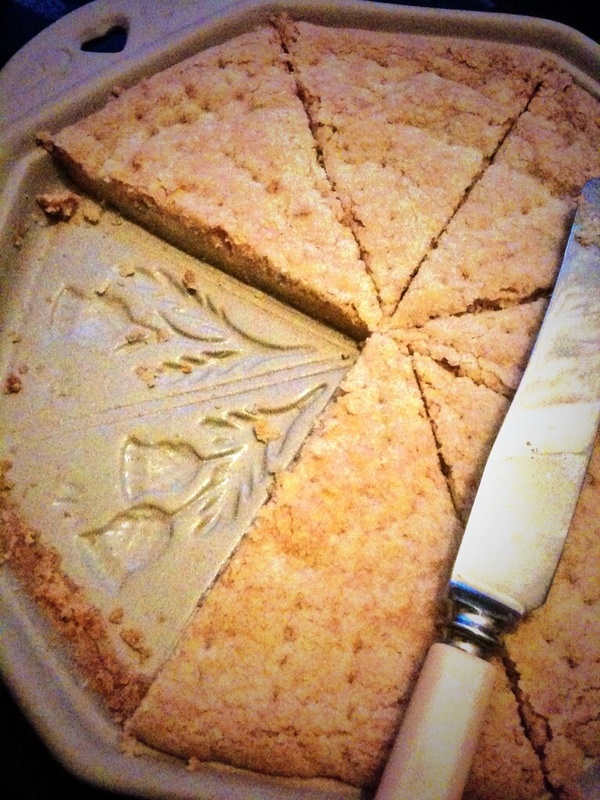 Whatever your measurement is (grams or ounces) follow this formula for traditional Scottish shortbread. 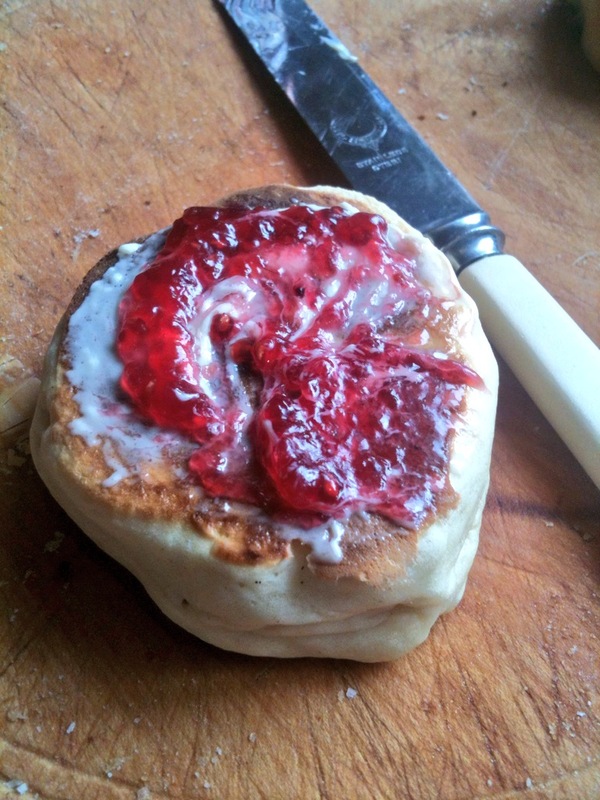 Beat the butter with a wooden spoon until creamy then beat in the sugar until light & fluffy. Add in the flour(and salt) little by little until you have a dough. Work the dough on the work surface to bring together then, either roll out and cut shapes or press into your tin(or mould like me). Place on a baking sheet if making biscuits, prick all over with a fork and bake at 180(gas 3) for 35-40 mins or until golden. If your shortbread starts to look too dark, cover with a piece of foil! Remove from the oven and whilst still hot dredge with more sugar. Mark the pieces, if you have baked in a tin and leave to cool completely. By the by….Saturday (17th May) was World Whisky Day so in light of that fact I made “shortie” in my thistle mould to go with a wee dram at night, suitably patriotic don’t you think? … Slainte! 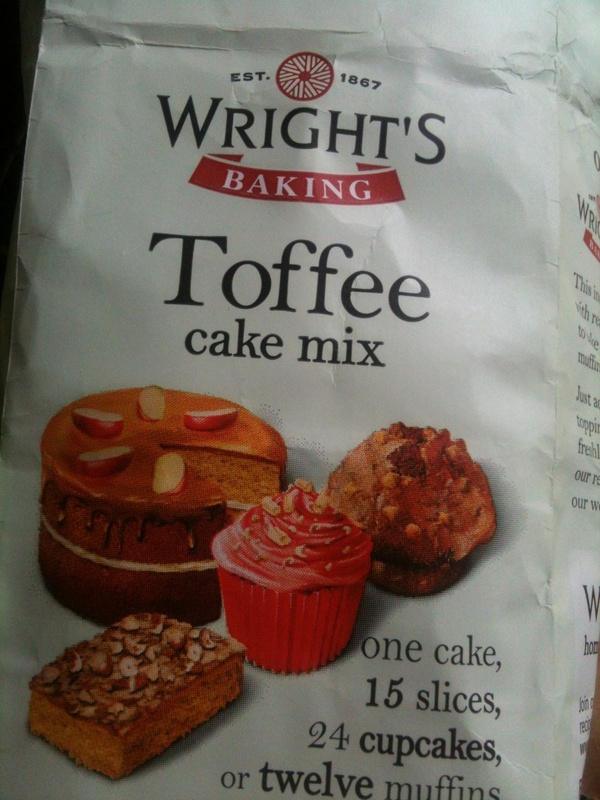 I had a Wright’s (<click here to see their site & more delicious bread and cake mixes) cake in the cupboard, I actually bought it with the intention of making a cake with the wee one. Oops! I wanted to bake something that was not just the regular toffee cake and I had some bramleys kicking about that I felt I should use up. Simple, let’s make a toffee apple cake! Easy, tasty and quick what more could you ask for? By the way, this is MUCH yummier than you imagine a packet could ever taste, nobody will ever guess it was from a mix, honest! 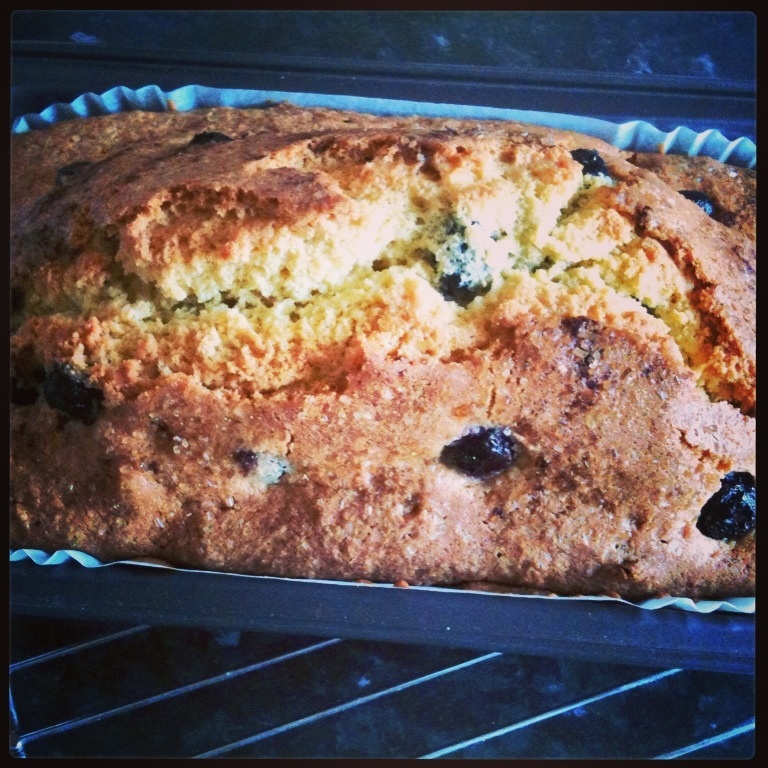 I was given this recipe while on holiday in the beautiful Perthshire Highlands. The lovely lady who gave me it told me it was given to her by Scot Herbs. 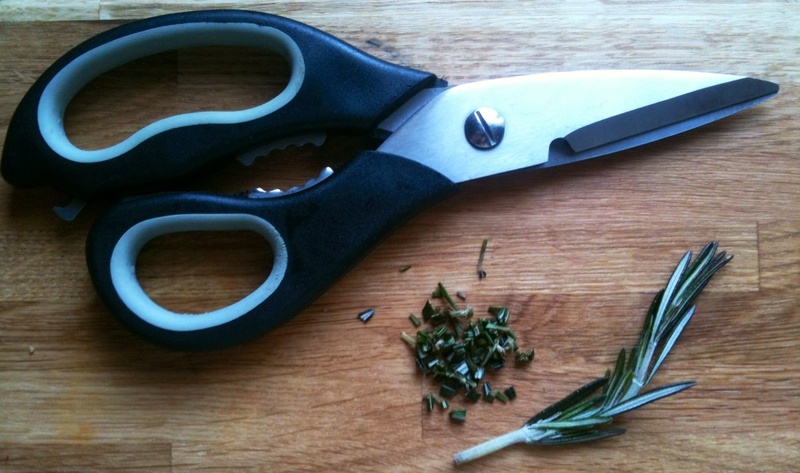 I was curious about the use of the herb rosemary in it(if I’m being frank, I thought it was a bit weird sounding). Worry not though Dear Reader, it’s fabulous! Here is the recipe, tweaked slightly(and added measurements in US cups[SO much easier than grams, right?] 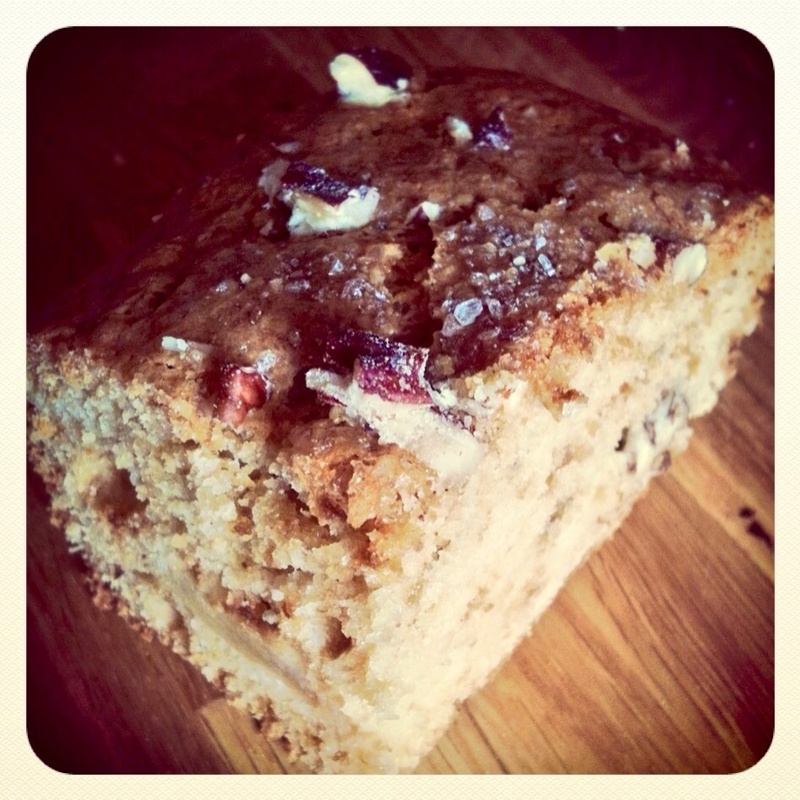 to my taste but click here for a link to the original Scot Herbs recipe! Preheat the oven to 170oC/Gas Mark 3. Beat in the eggs one at a time, adding a tablespoon of the flour after each egg. 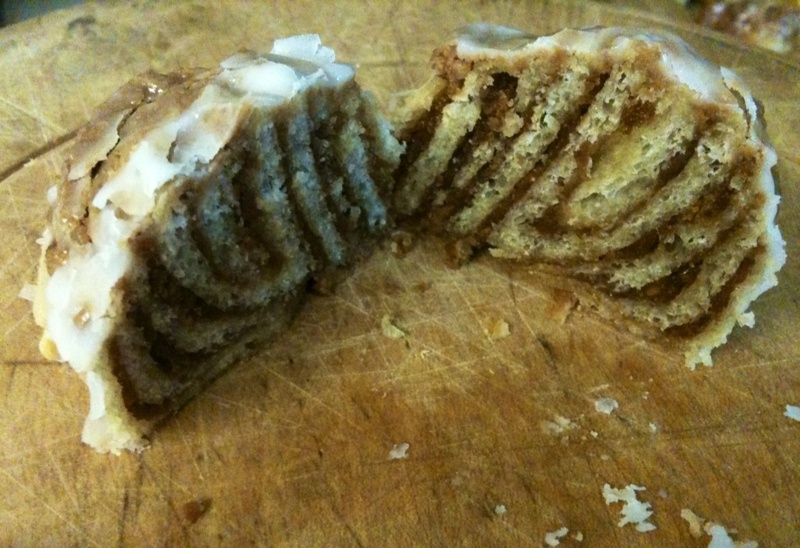 It’s got good staying power this cake if, like the Scot Herbs site says, it lasts that long! Freezes well too. I picked, the quite cool sounding American-Style Eggs from The Silver Spoon cookbook. 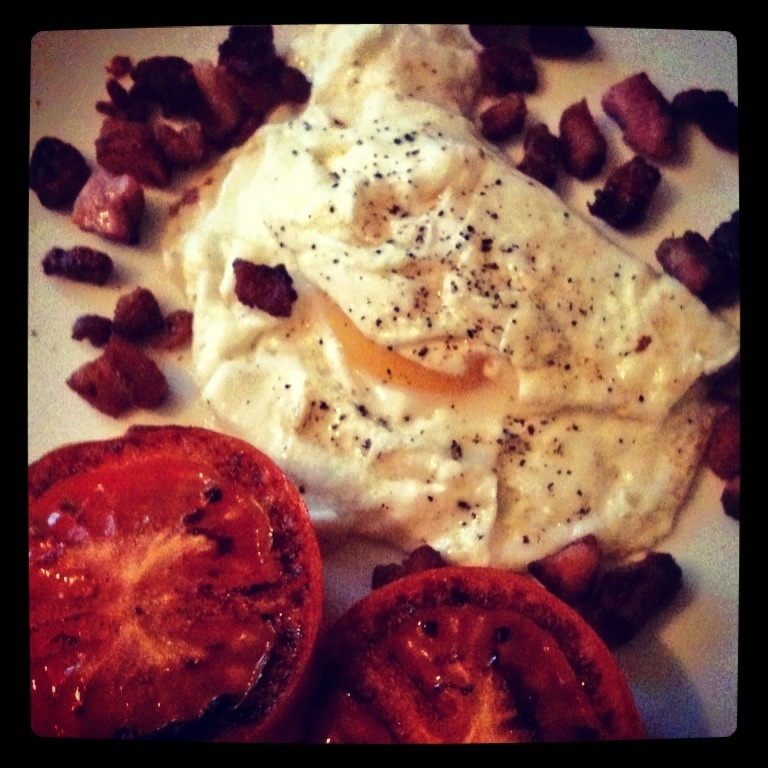 Now given that there are only 3 constituent parts of the “recipe” it’s hard to not feel somehow it’s a bit cheeky to even call it one, but considering the age of this Italian cooking bible I guess we can let off the writer for what basically amounts to bacon and egg, with a tomato on the side. 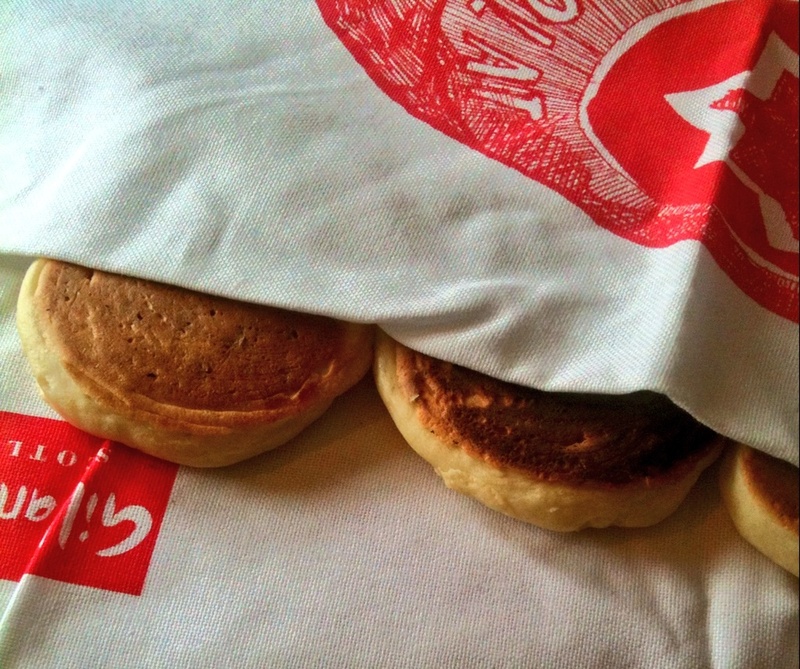 This recipe is so easy that I can’t really understand why I don’t make more pancakes. 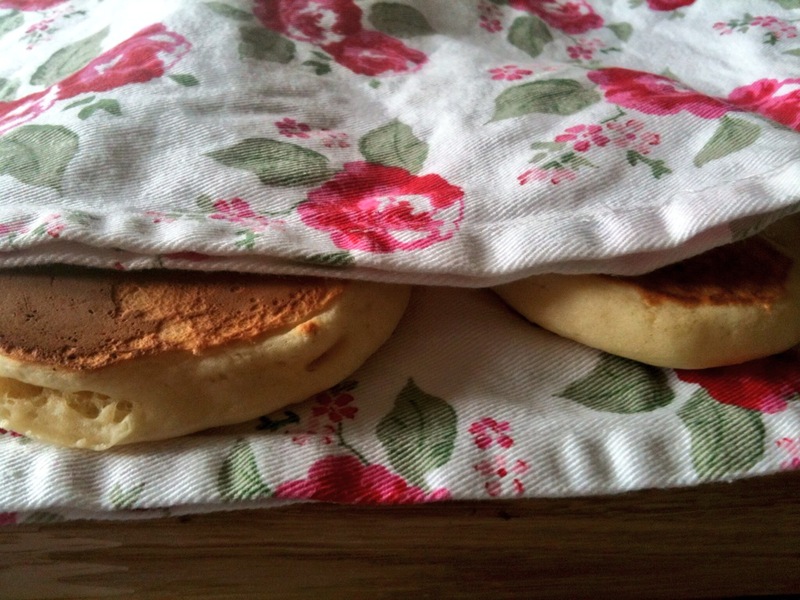 My Granny Rose always had pancakes ready when we came home from school, and if she had been busy, you could be sure there would be some in the freezer. 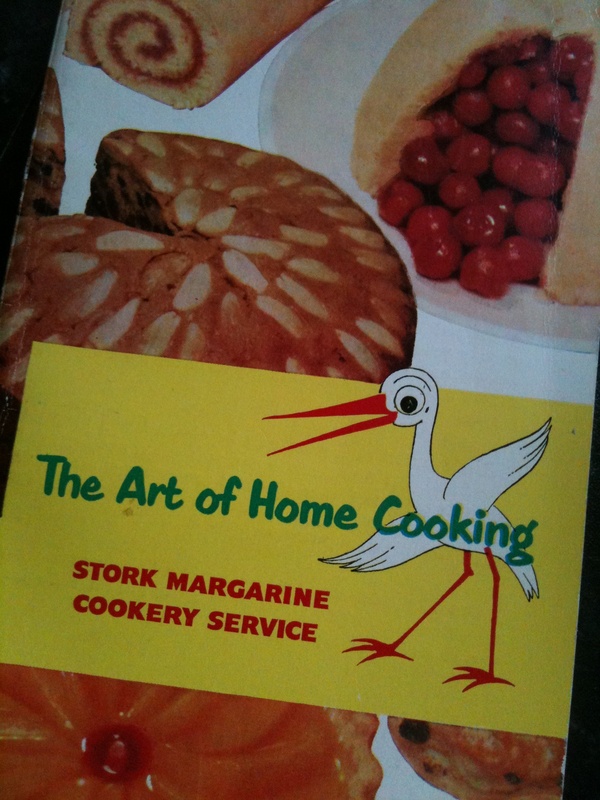 Incidentally Granny Rose never had a really had a proper recipe for so this is the one from my go-to book. They are simple, tasty and much better than a chocolate bar for the kids when they fancy a munch(yeah, ok me too!) In other words: the perfect snack! Put the flour, salt, sugar & baking powder in a bowl. 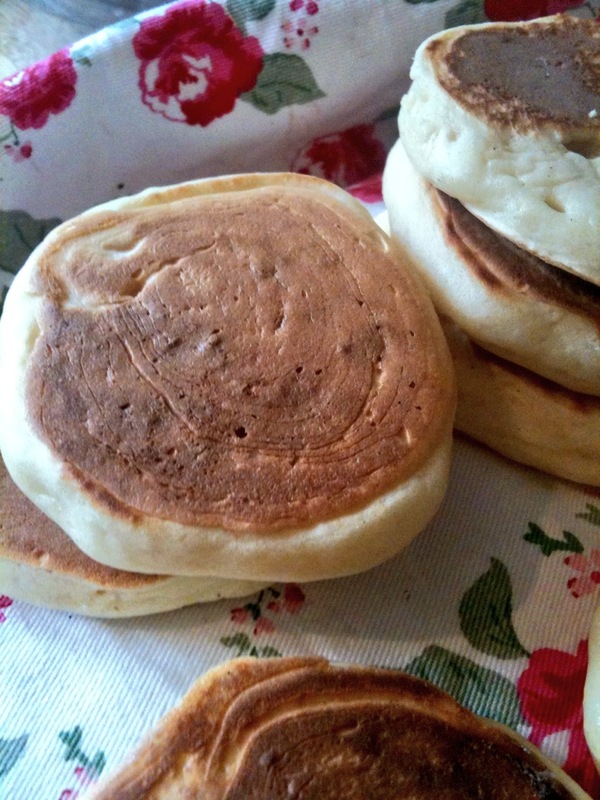 Cook on a med hot girddle or heavy based frying pan until you can see bubble forming on the surface of pancakes(not bursting though). Flip them babies over and continue cooking until golden. In our house these are generally eaten when cold with butter and jam. Yum!